Together with the Federal Office for the Environment of Switzerland (FOEN), NVTerra developed an equipment to purify waste water to reach river quality. Thanks to NVTerra’s technology the purification process could be simplified and stabilized. The equipment, installed in February 2014, was designed for mobile application and could be carried around to different locations in order to win experiences in the use of the Ferilec coagulant. 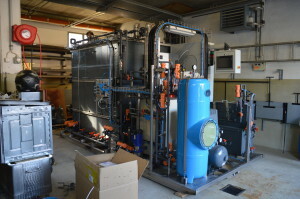 The basic design of the equipment is of the NVSani-type and could produce about 25 m3 of purified water per day. This experience showed that the use of Ferilec was as efficient as the currently used FeCl3 for the removal of impurities. Moreover, the Ferilec allowed to remove heavy metals with a similar result as FeCl3 and with a smaller impact on the environment.